This week, Donald Trump endorsed Mitt Romney for president of the United States. So, I’m sure you’re wondering, exactly what does it mean to be endorsed by the Donald? Does Romney now have a secure path to the White House, all because Trump gave him his blessing? Could the pope’s blessing be not far behind? Who's he going to endorse next? Pick me, pick me! Well, the way the media gets their undies twisted into a knot every time Trump announces that he’s going to make an announcement, you’d think that would be the case. I guess it means, Romney should start packing his bags and head on over to 1600 Pennsylvania Avenue. After all, getting an endorsement from Trump must be akin to receiving a knighthood from the queen, a sainthood from the pope, or being crowned Miss Universe. As abrasive as The Donald sometimes can be, he must have done something right to warrant all the media attention he gets whenever he decides to thrust himself upon the political arena. Perhaps he once did the man upstairs a favor and is now calling in his chips. On the other hand, this does have the markings of a pact made with the devil. Which would explain why Trump has been elevated to sage extraordinaire. Why else would we the media keep falling for covering his press conferences as if he’s about to announce the cure for what ails us? Reminds me of the old TV commercial adage, “When E.F. Hutton talks, people listen.” Of course, E.F. Hutton went defunct years ago, no doubt because people were no longer listening. Yet, somehow we keep listening to Señor Trump. Got to hand it to the man: He sure is savvy. Which is why I’m going to ask Trump to endorse me. So, when I sign up for match.com, my profile will include an endorsement message from Trump himself. That should make me date-worthy! Whenever we fly cross-country, Trump will be there to christen the plane. If someone annoys my son at work, Trump will be there to tell him he’s fired. If the IRS ever calls me in for an audit, Trump will be there to bully them into being nice to me. I don’t know what draws the press to him, so that they’re hanging on his every word, but I’m hoping some of Trump’s brilliance rubs off on me. Maybe with his endorsement, I’ll become a more scintillating writer. I’ll even remember to take out the trash Sunday evenings, and say cool things like, “Donald dahling, where’s the crown you lent me?” Maybe I, too, will become so full of myself I start believing my own, er, dribble. Seems to me, now that Trump has endorsed Romney we should be calling the candidate, Sir Romney. Might as well start calling me, Lady Monica. That’s how good he is. On the other hand, maybe this has nothing to do with The Donald, per se, and all to do with the Donald name. So here are a few other Donald’s I’m anticipating will give an endorsement to Mitt, Newt, or even, Ron Paul. Whad’ya say, boys? You’re not going to let The Donald steal your thunder. Time to get off your derrières and endorse, endorse, endorse! So, tell me, whose endorsement are you waiting for? How about I give YOU my endorsement? The Trump is a very entertaining man, must see TV. But sometimes he takes a serious issue and make a joke out of it in a political way that can be distasteful at times. But he’s a great man according to news articles. Yes, I’m not sure he should be dabbling in politics as much as he does. It ends up making a mockery of it. Funny post! I love to laugh at The Donald. I’ve even watched his Celeb Apprentice. Who would I want to endorse me. Hmmm. Nancy Werlin’s endorsement would be cool. She writes YA thrillers, and I just published one. It’s the hair. It’s both magical and mesmerizing. Plain and simple. Don’t I know it. What I’d give for hair like that. I could then be rich and famous, too! Do you think he’ll endorse me too if I ask nicely? Maybe I’ll wait and see how his endorsement with you goes first. Monica, I think the Donald should endorse our blogs. Maybe then I could buy the DSLR and a laptop for the Son! That would be the day! However, I’m sure there would be some caveat. Maybe the Donald would make us write weekly blog posts about him, or worse, date him. Shudder! I take that back. I don’t think the Donald should endorse our blogs. We’ll have to figure out another way to get together any extra cash we might need. Sigh. Oh, Bella, can you imagine the insanity if our blogs become The Donald themed 24/7?? We’d lose readers hand over fist! I couldn’t take it! You’re right, we have to come up with another cash cow. The Anti-Donald. Are there any dogs named Donald? Good question, Bongo. I’m not sure, but if you find out, let me know! Donald. Mitt. What is this world coming to?! Good question. I want to know that, too! Maybe Don Knotts.. 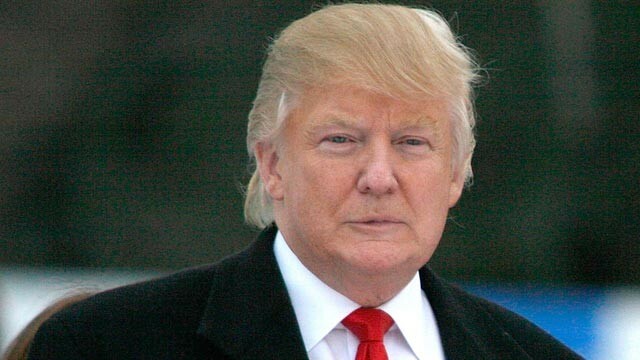 I really want to know why Donald is allowed in public with that hair. I’m sure he has a team of make-up team, surly they think it every time the dull the glow of his shiny face. ( I know, I am off topic, but his hair is hideous). Aside from that, great post. Perfect for my Sunday cup of java..
La Donald should be arrested for carrying hair like that in public. It’s assault with a deadly weapon or something similar, if you ask me. Too ridiculous, it’s funny. Funny stuff, Monica! I, too, can’t understand The Donald’s power and prestige, but hey, if it works for him…. Since you’ll be so chummy with him, would you put in a good word for my son, that he finds suitable employment this summer?!! Hahaha! This made me laugh! Awesome! You’re so silly and fun! Great post! Ha ha! I’d love to see all the candidates who had to end their run for president, wind up on The Apprentice. That would be awesome! I’m not sure it really matters who he endorses, I have my doubts that anybody is going to be able to get us out of this mess. Unless of course the RIGHT WOMAN applies for the job. Seems like we women have gotten pretty darn good at cleaning up everyone else’s messes. Your last sentence makes such sense, as I have just finished cleaning up the bathroom after my husband used it. I know, I know – TMI and gross! Sorry. However, in the sense and context in which you wrote it, I wholeheartedly agree. Diane, Yes, it’s gross, but also, so true. I think Debra is right on the money! OK, that was a little intemperate. Monica, feel free to delete my comment. Trump gets our attention because the media ram him down the public’s throat. Also, he’s a billionaire. People should just stop writing about him.Maybe then he’ll go away. I find the guy totally uninteresting. Just another airhead moron that’s thrust into the limelight because the media and (some of) the public are full of airhead morons. Well, I hope you understand this post was all tongue-in-cheek. Just calling out the obvious. The man is rather obnoxious and I’m tired of him, too. I wonder if he has a son you could date or a very Rich friend? I def want his endorsement. Kim, when I get The Donald to endorse me, I’m make sure you’re covered too. I think it’s a fabulous idea to get him to endorse both our blogs!! 🙂 Maybe he can write a forward? I’m not sure that he is cringing. First of all, the endorsement was made at Romney’s rally. Second, Romney seems to have won Nevada, and clearly that was because of the Trump Bump. Trump is a Tea Party favorite and according to CNN, the Tea Party was out in full force today. Ergo, Trump brought them out to caucus. So, success! HA HA!! This blog piece is hilarious, Monica. I never actually THOUGHT about all this but you make such a great point!! His opinions or endorsements mean nothing to me or anyone I know. I would rather have Yogi Berra’s endorsement. He has been artful in projecting himself as a king maker and the press has so projected as well without basis in fact. I always get Yogi Berra and Yogi the Bear confused. But just to be clear, you mean the baseball player? In which case, I’d like Reggie Jackson. Or maybe Joe DiMaggio. Nah, Kevin Costner for his role in that baseball movie. And, I so agree. Trump has been triumphant in convincing the press he’s a king maker. Which is kind of scary how easy they can be duped. I am baffled by the Donald. He seems so cartoonish to me… I can’t understand why he gets any attention at all. I guess he buys it. Shary, so am I. Complete thunderstruck. What do others see in him? I even dislike his show. Can’t watch it at all. Did you say O’Donnell or Donald? You mean those twins who talk really loud? Nah. I don’t care for their endorsement. I want Oprah’s or Warren Buffet’s. Donald’s endorsement wouldn’t make me more or less likely to vote for someone since that’s not the candidate’s fault. But the candidate taking the endorsement seriously and kissing Donald’s ring, does make me less likely to vote for that candidate. I think that would be bordering on creepy if they kissed his ring. Or maybe we’d have to calling The Donald, Pope Trump. I’d love to see Donald Duck endorse Newt… he reminds me of a cartoon.